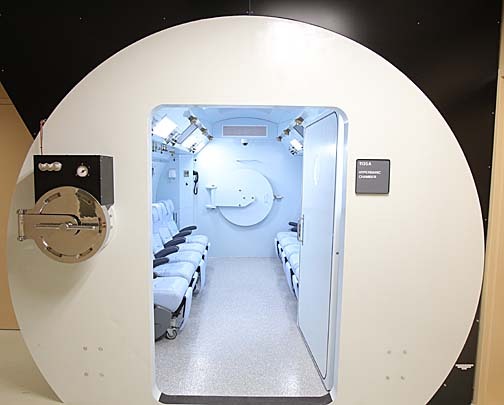 The University of Toledo Medical Center (UTMC) in Toledo, Ohio, has swiftly opened its Wound Care and Hyperbaric Center, featuring the new OxyHeal 4000-Omega multiplace chamber. (See our January 5 post.) Named for its omega (Ω) shaped geometry, the chamber is the first of its kind in the US. At 21 feet long and 10 feet wide it can accommodate 10 patients seated and 4 lying down. University of Toledo is also home base for John Feldmeier, DO, president-elect of the Undersea and Hyperbaric Medical Society (UHMS). CLICK HERE to read today's UTMC announcement. CLICK HERE to read OxyHeal's press release.